Harrogate Pythons were left frustrated after being edged out by a 40-32 scoreline on the road at Wensleydale in Yorkshire Three. A poor first-half performance saw Dan Bird’s troops trailing 33-8 at the interval, and despite a vastly-improved showing in the second period, the men from Pennypot eventually came up just short. 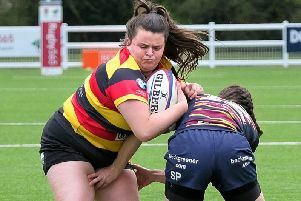 The Pythons couldn’t have made a worse start to proceedings, falling behind after less than 60 seconds and then finding themselves 17-0 down with just seven minutes on the clock. The visitors kicked off and conceded a penalty straight away which resulted in Dale taking a 3-0 lead in the very first minute. An overthrow at a Pythons line-out then led to a converted try for a home forward just two minutes later, and things went from bad to worse when the hosts touched down again. A further two penalties were successfully booted over to extend the Dale advantage to 23 points before Ross Fallenstein finally opened the Harrogate side’s account with a well-struck penalty from a distance. The Pythons were struggling in the tight with Dale putting the scrum under huge pressure and as aresult the visitors were largely living off scraps. Despite this, they reduced the arrears further at 23-8 when Charlie Jolleys turned over a line-out and Max Sharp sailed through a gap in the defensive line to touch down out wide. Dale were soon back in the ascendancy, however, and the away pack was driven backwards at a scrum allowing the home number eight to pick up and score from close range. The conversion was added for 30-8 after 32 minutes. Another penalty saw the lead extended to 33-8 at the interval, and coach Bird was forced into a half-time re-shuffle of his pack, introducing Ben Kernoghan, who immediately bolstered the visitors’ scrum. The Pythons began to enjoy more possession as they competed better up front. Good pressure on a Dales scrum saw the hosts penalised, and from Ivan Drane’s quick tap, the ball was sent wide for Sharp to score his second try of the afternoon. Dale hit back with a converted try to stretch their lead to 40-13 with just 10 minutes remaining, but sensing that they had nothing to lose, the Pythons began to throw everything at their hosts. As they pressed forwards, Fallenstein was stopped illegally, leading to a yellow card for the offender and the Harrogate side went wide for Steve Smith to crash over for 40-18 on 75 minutes. A four-try bonus point was then secured when another Dale scrum was sent backwards and Fallenstein powered in from close range, adding the conversion himself for 40-25. From the re-start, a Dale clearance kick was charged down and Jon Pickard followed up to touch down. Fallenstein added the extras once again, but time then ran out on the Pythons’ comeback bid with them still trailing 40-32.